Now that the euphoria of my first truly successful firing has, if not worn off (it may never wear off), at least settled a bit, it's time to review what worked and what didn't in last week's firing. This despite my lingering desire to just dance around in the kiln yard shouting, "Fecit!" Winner: Amber Celadon, using local clay in place of Albany Slip. It was not exactly like the original recipe, but it's hard to say whether that is due to differences in the clay, or to interactions with the salt & soda vapors. But the surface was quite delightful, nice and fat, moving from opaque caramel to transparent espresso with differences in thickness. Loser: My new tenmoku. Well, loser is a harsh word. It's not that it is an awful glaze; only that it is not tenmoku. Too greenish-gold, too full of surface crystals, and too similar (but less nice) to Amber Celadon to find a place in my glaze palette. Winner: Bauer Orange Flashing Slip. But we knew that. Loser: The upper rear corner of the kiln! Didn't quite reach temp. 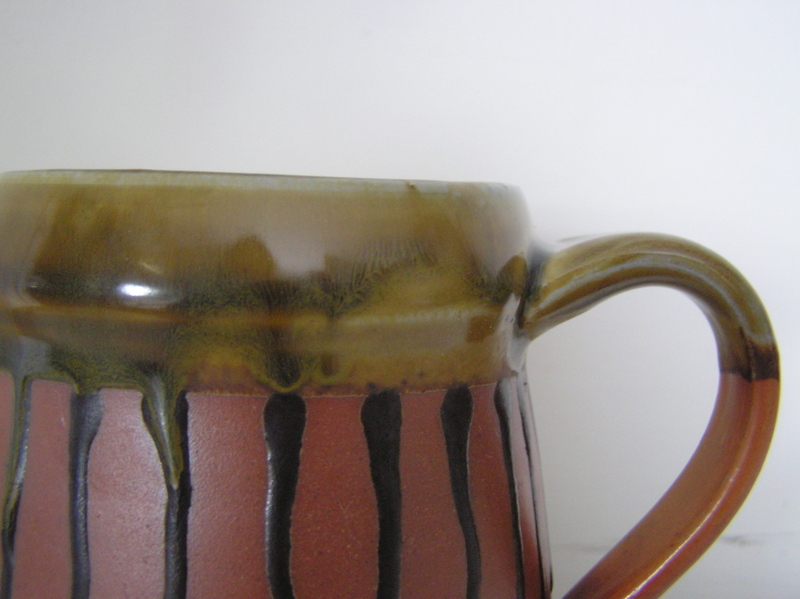 I don't see a good way to fix this, but I am investigating a work-around in the form of some ▴8 or ▴9 glazes. 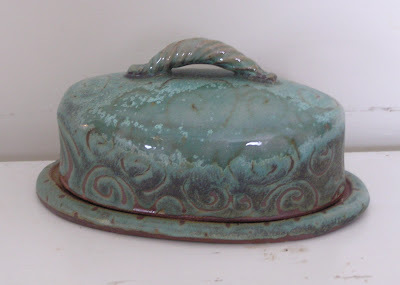 I am in glaze-exploration mode anyway, and will take it as a spur to try new things. Loser: Lipton Sig. Or rather, me, for either mixing it too thick (but how much thinner can it get???) 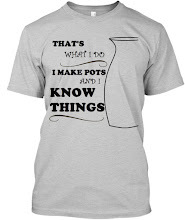 or for applying it to bisqueware. From now on that is a greenware-only slip. It flaked off in a couple of places. I am not entirely sorry, as it means I get to keep a couple of the mugs, but that'll be quite enough of that, thanks. Winner: Satin Doll Black. (Recipe later: I'm too lazy to go look for it.) 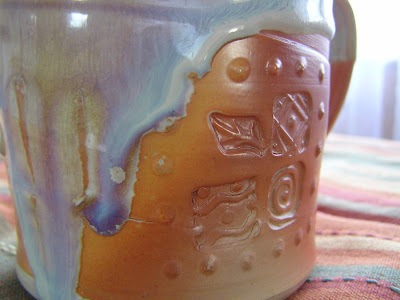 Fluxed in the cool parts of the kiln, looks great trailed and over my flashing slips, etc, etc. Winner: Latex resist! Got a post devoted to latex in the works. Jury is still out: 50/50 soda ash & red art clay, as a glaze surface. Also want to try 50/50 soda ash & kaolin. Anyblah. Next firing Saturday March 5. Lots to do before then!